RTI (ready to install) 4074 Leopard Motor and Esc combo by OSE. This plug and play power system is meant for a boat that requires 1500-2000 watts of power in the 4-6 pound area. We have done all the hard work, soldering and installing the parts for top performance. Offered in the following kv ratings. Leopard 180 Version 3 Esc with added ESC Bank. Ose 6.0mm bullet connectors on the battery and an 6.0mm extra set for your batteries. All connectors and water jacket installed. All included items are in the picture. *Because there are so many variables with each hull style and installation, its impossible to specify all the applications this combo system will work with. Please email use prior to purchase if you have any questions about which rpm version to pick. Good quality lipo packs. We suggest 45c 5000mah packs. Customer to solder the included connectors to your packs. This motor fits well with the ose-80600 or ose-80610 motor mounts when used with the 4050 water jacket. 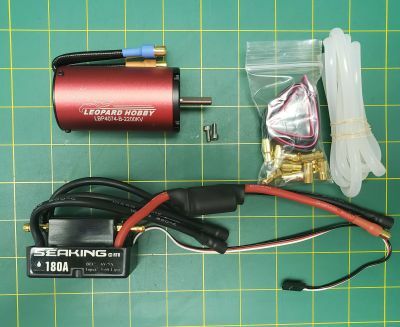 NOTE: As of 01/01/2014 this item now comes with a Leopard 180 ESC. This is the same as a Seaking 180 except sold under the Leopard brand. 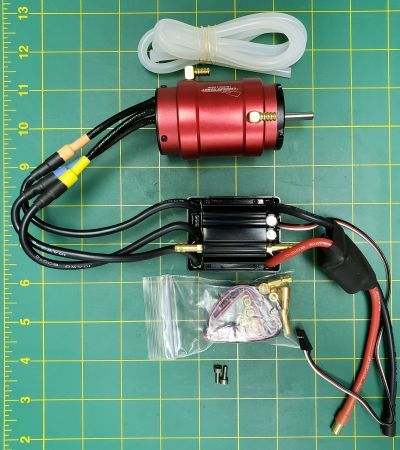 6.0mm connectors are now also used on both the motor to esc connection and battery side.